On 2 July 1958, Seven Oaks House in West Kildonan was opened as a museum. Since that time, over 3,000 people, including many students, have visited the old home on Rupertsland Avenue. Now closed for the winter months, it will be opened again next spring. Then, many more people will have an opportunity of seeing Seven Oaks House and its many interesting exhibits. It all began 107 years ago when John Inkster selected a site for a new home on the west bank of the Red River, in the Parish of Kildonan. Nearby stood seven large oak trees. Here, on 19 June 1816, occurred the Massacre of Seven Oaks in which Governor Robert Semple of the Red River Settlement and twenty of his officers and men were slain by followers of the North West Company. Source: Archives of Manitoba, Winnipeg - Homes - Inkster, John 26 (N10604). In 1852 the building was well under way when the disastrous Red River flood halted the work. The water covered the Inkster property to a depth of four feet and swept over the prairie for many miles. But John Inkster, reluctant to leave his unfinished house, laid a temporary floor across the second storey and on it erected a crude canvas shelter. Here he and his wife lived until the flood waters receded. Two helpers stayed there also. They were employed building rafts and salvaging lumber and logs, furniture and household effects. The rest of the family, together with the livestock, were sent to high ground near Lilyfield (half-way between Winnipeg and Stonewall). There they stayed, beyond the reach of the flood, until it was safe to return to Seven Oaks. 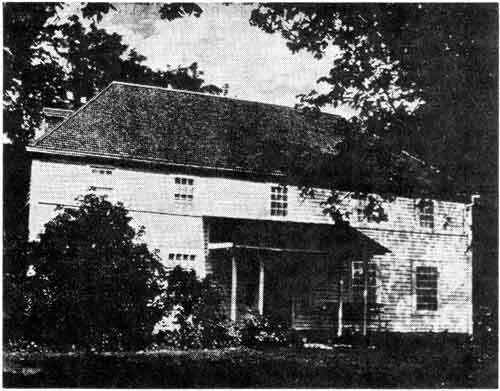 The house was completed in 1853. The walls were built of oak logs rafted down the Red River. They were whip-sawn and hewn to about seven inches square, then hand-planed. As one log was placed upon another, each was pinned to the other with wooden pegs. The shingles, made from cedar logs and split by hand, were sized with a drawing knife. Some of these may be seen at Seven Oaks House, together with a portion of a cedar block from which they were hewn. A British pensioner named Turner, one of the many who were settled along the north bank of the Assiniboine River west of Upper Fort Garry, plastered the interior walls. He used buffalo hair to bind the plaster and a fragment over two inches thick is on view. The interior woodwork was fashioned from spruce logs, with the exception of the ceiling panels which were made of basswood. The manufactured articles such as glass, paint and putty, locks, hinges and nails were imported from England. The nails were hand-forged, four-sided, and tapered to a flat, bevelled point. If they were to be driven in near the end of a boards, holes were bored first with a brad awl to prevent the boards from splitting. The same type of nails may be seen in the woodwork at Lower Fort Garry. Immediately adjacent to Seven Oaks House is a smaller log building which may have been a part of the original house. This was the store and Post Office. Colin tells us that his father imported trade goods from England by way of Hudson Bay and brought them to the Red River Settlement by York boats. His American goods came from St. Paul by Red River carts. He also records that his mother worked in the store and that her ability to add up columns of figures and balance accounts was remarkable. John and Mary Inkster raised nine children, four sons and five daughters. One son, William, was a schoolmaster. He died of typhoid fever while still in his 30s. It is said that he was a man of outstanding ability whose untimely death was mourned as a great loss by the whole community. Another son, George, settled in Minnesota, and yet another, John, was chief engineer on a Mississippi steamboat. He lived in New Orleans, but sent his children north to Red River to be educated. The boys attended St. John’s College and the daughter was enrolled at St. Mary’s Academy. The most prominent of the Inkster children was undoubtedly Colin. He was for fifty-one years High Sheriff, first of the Province and later of the Eastern Judicial District. He was rector’s warden of St. John’s Cathedral for sixty years. St. John’s College Council claimed him as a charter member and he served on its council until 1925. He was a member of the Upper Chamber in the Manitoba Legislature. It was his deciding vote, as Speaker, which abolished the body in 1876. In and about Seven Oaks House today, memories of the Inksters linger. The simple pleasures which surrounded their families, friends and neighbors, their trials and tribulations, are preserved in the letters and personal records. The great events which moved about them, in which some played prominent parts, are recalled in the public accounts and documents. The furniture, tools and utensils, the firearms and Indian relics, gather together the leisure, the work and the strifethe pattern of life in the Red River Settlement. The sofa, hand-made and upholstered with a palliasse, is where it always stood. The grandfather clock and grand piano are in their appointed places. A solid oak china cabinet contains pieces of Mrs. John Inkster’s blue and white Copeland dinner service, green and white breakfast set, and several red-bordered Chelsea plates. Many pieces of heavily filigreed cutlery may be seen in the silver chest. In the master bedroom stands Mary Inkster’s round-tipped steamer trunk, surrounded by hand-woven scatter rugs. The mahogany bed, with its great oval headpiece, bespeaks a substance and a craftsmanship not found in modern factory-made furniture. In a smaller bedroom a sea hammock hangs from the ceiling. It belonged to Mr. John Inkster’s brother, ,a retired sea captain, who spurned “uncomfortable” beds in favor of his beloved hammock. A battered white ensign hangs on the wall. Pipe, spectacles and reading glass rest on a side table. On the floor beneath, a rum bottle stands in dishonourable retirement. On display in the kitchen are heavy copper pots and kettles, granite mixing bowls and earthenware jars, spice and coffee grinders, wood stove and overhead smoke-catcher. This is Seven Oaks, one of the oldest habitable private homes in Manitoba. Here, the history of the Red River Settlement lives on in the house itself, in the furnishings, and in the memories and mementos of those who lived therein.